Pumpkins are so much fun! 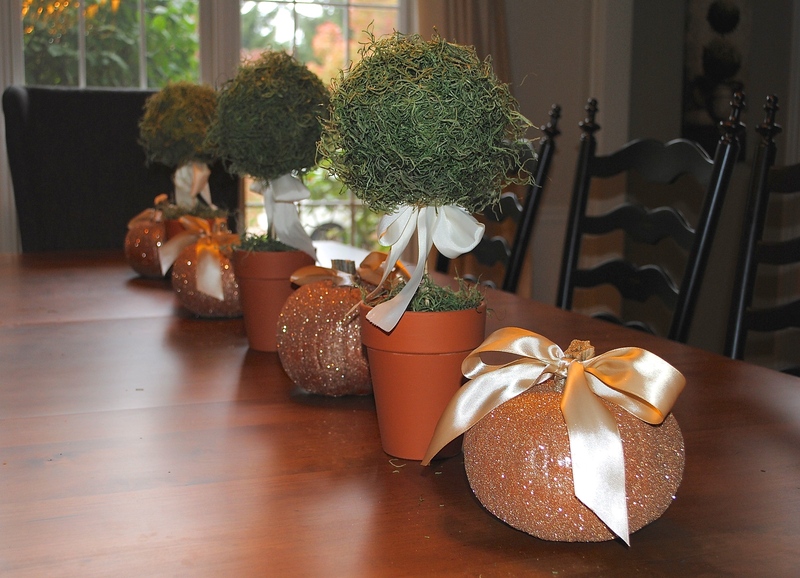 I have tried so many things with them to make them fancier than the typical orange pumpkin sitting on the table. Several years ago I saw this on Martha Stewart’s website and I decided to try it. To date it is my favorite pumpkin idea ever. The last two years I painted my pumpkins white, which I still like, but the glitter pumpkin is fabulous. This year, I think I will combine the two. Some white some all glittery and I think I will look for a silvery glitter. Last time I used an orangish-gold color. 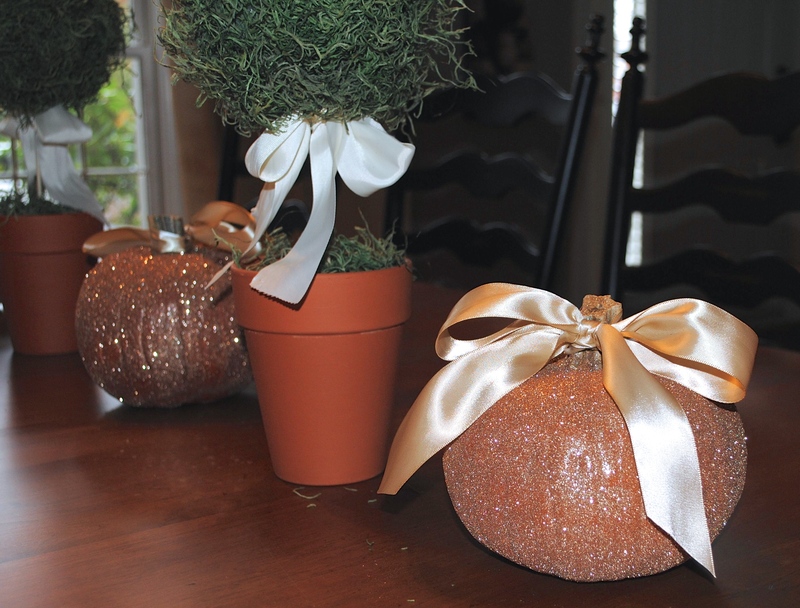 It was really easy and fun to make these glitter pumpkins. You will need: pumpkin any size, spray glue, fine glitter. 1. Put down newspaper or a box top. Something that can catch the glitter that falls off. 2. Spray a small area of the pumpkin with the spray glue. Be sure not to spray too long in one area so you get drips. Those will show up as clumps of glitter. You want to get the glue on as evenly as possible. 3. Sprinkle on the glitter. 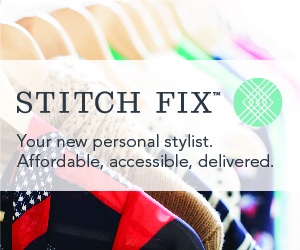 Lots of it will fall off, but you can reuse it. 4. Repeat until the entire pumpkin is done. The glitter comes in many different colors at your local craft store. I used the super fine variety which I thought gave it a very classy look. Have fun, and please comment with your pumpkin ideas! 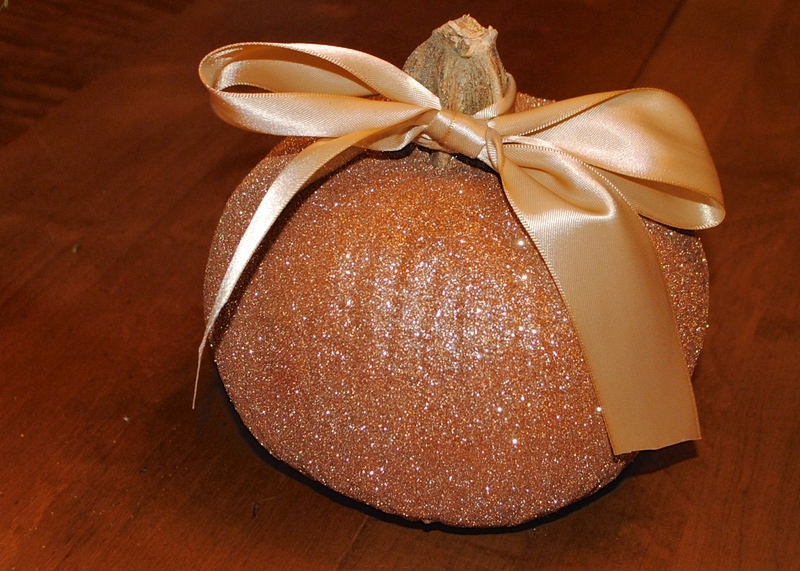 Two words I LOVE this time of year… Glitter and pumpkins! So cute!